The Fourth Annual Judicial Excellence for Colorado Dinner, held November 16th at the Denver Marriott City Center, was a remarkable success. A celebratory mood pervaded as the record crowd, well over 400, enjoyed a lively cocktail hour sponsored by Thomson West before adjourning to the grand ballroom for dinner. The dinner, the largest event hosted by the Colorado Judicial Institute (CJI), supports the Judicial Education Fund and the programs of the CJI. The evening began with recognition of the importance of the number 40 for CJI and Colorado Citizens in 2006. CJI Board Chair Gale Miller and Executive Director Becky Miller Updike thanked the many individuals, corporations, community groups, legal association, newspapers and law firms that contributed to the decisive defeat of ballot initiative number 40. The initiative would have created a constitutional amendment that would have retro-actively imposed term limits on all Colorado appellate court judges resulting in massive number of appellate judges being forced off the bench immediately regardless of the results of the most recent judicial retention votes by Colorado citizens. CJI served an integral role it the coalition that worked to educate the public and encourage a “No” vote on 40. Becky Miller Updike, having devoted many of her first months with CJI to the “Vote No 40” campaign, praised Coloradoans who recognize the value of judicial independence. The November 2006 election also represented the 40th anniversary of the vote that established the judicial merit selection system in Colorado. The non-partisan merit selection system in Colorado is a national model that assures qualified candidates will be placed before the Governor for every judicial vacancy. May 1, 2006 through April 30, 2007 has been declared a celebratory year during which there will be educational programs for the public. Following dinner, the CJI Judicial Excellence Awards were presented. Each year CJI recognizes three jurists who have displayed an outstanding commitment to judicial excellence, innovation, and community activities. Nominations are solicited each year, usually beginning in June, from the legal community. The CJI Judicial Excellence Awards Committee, chaired in 2006 by board member Robert N. Miller, faced the daunting task of selecting only 3 recipients from the numerous outstanding nominees. The 2006 District Court Judicial Excellence Winner was the Honorable C. Dennis Maes from the 20th Judicial District in Pueblo. District Chief Judge Maes has, throughout his career, dedicated himself to improving the delivery of court services to the citizens of Colorado, mentoring young lawyers and youth, serving on countless committees and boards, and providing a positive and open work place for court staff. Judge Maes has worked to create partnerships between the judicial department, school districts, and the Department of Human Services to better serve at-risk youth. And despite the fact he was not permitted to display his talents at the dinner, Judge Maes’ Sonny & Cher lip-sync is renowned. The 2006 County Court Judicial Excellence Winner was the Honorable Lynn J. Karowsky from Weld County. Judge Karowsky is remarkably well respected by his peers, court personnel, members of the bar, litigants, and community. Among his litany of accomplishment, Judge Karowsky participated in the establishment of a dedicated domestic violence court in Weld County, was a founder of the Byron White Inns of Court, served on a committee that drafted rules for small claims, and worked to combat underage drinking. Judge Karowsky is deeply committed to and involved in his community. He has taught in the business college at the University of Northern Colorado for many years. His volunteer activities include the United Way, the National Organization of Women, the Union Colony Civic Center Board, the Board of the Beth Isreal Synagogue, the Greeley Chamber Orchestra and the Greeley Philharmonic Board. Judge Karowsky’s colleagues and family members set a new record for the Judicial Excellence Dinner when 14 of them joined the Judge and Mrs. Bev Karowsky at the dinner! The 2006 Magistrate Judicial Excellence Award was presented to the Honorable Louis A. Gresh of the 18th Judicial District. Magistrate Gresh efficiently, objectively and with a calm demeanor handles a docket of family and domestic issues that are emotionally charged and frequently carry drama and complications unseen in other court rooms. Magistrate Gresh has extensive family law expertise and frequently shares his innovations and commitment with Colorado Bar Association Continuing Legal Education Programs. Magistrate Gresh serves as a mentor to at-risk youth through the Douglas County Partners Advisory Board. He served as board member and chair of the Rocky Mountain Heart Fund for Children successfully working to require insurance companies in Colorado to cover heart birth defects at the time of birth. He served on the board of Denver Mobility Inc. And think twice before you challenge the culinary skills of this 2000 winner of the Douglas County Culinary Challenge, he has practiced Tae Kwon Do for years and served as an Athlete Arbitration Judge for the United State Olympic Commission! The CJI board of directors chose to present the Colorado Judicial Institute Judicial Independence Award to retired Colorado Supreme Court Justice Rebecca Love Kourlis. Justice Kourlis, now the executive director of the Institute for the Advancement of the American Legal System, was recognized for her consistent dedication to judicial independence, judicial excellence and innovation in judicial functions. Former CJI Board chair Richard Gabriel noted that “…there is no jurist who has better represented everything that CJI strives for than the Honorable Rebecca Love Kourlis.” Justice Kourlis, in her eleven years on the Supreme Court spearheaded significant reforms in the court system related to juries, family law and attorney regulation. The Judicial Independence Award, presented at the discretion of the CJI board, was created in 2005 to recognize individuals who have shown outstanding dedication to the principles of judicial independence. Chief Justice Mary Mullarkey briefly spoke about the CJI Judicial Education Fund. The fund, established in 2001 and supported by the Judicial Excellence Dinners, has supported many continuing education programs for the Colorado judiciary and judicial department employees. More information about the fund is available by clicking here. Former Chief Justice of the Texas Supreme Court, the honorable Thomas R. Phillips, delivered the keynote address “Life Without Merit Selection: The Good, The Bad & The Ugly.” Justice Phillips, making good use of his Texas dry-wit, shared his experience of contested, partisan judicial elections. In Justice Phillips view, there are some good points to judicial elections: They provide the opportunity to educate the public about the judicial system; judges are humanized as they are forced to leave their traditional base and meet with community groups, professional organizations and unions; party labels provide a general idea of judicial positions; and, judicial elections create a well informed “no” voter. The “bad” of judicial elections include an irrational opposition, a dramatic lack of candidates, the chance of massive turnover, personal campaign fund raising by judges, divisiveness within the community and judiciary, and a loss of public confidence in the judicial system. And the ugly, presented in a startling DVD short, are the tabloid quality television advertisements for partisan judicial elections. The advertisements could only be described as negative campaigning taken to an entirely new level. Colorado citizens, thanks to the merit selection and judicial retention election system, will not be subjected to such unpleasant ads. The 2006 Judicial Excellence for Colorado Dinner was a celebration of accomplishments, a commitment to excellence, and a promise of a secure future for judicial independence in Colorado. CJI extends a heartfelt thank you to all of our sponsors, many of whom have supported the Judicial Education Fund since its inception. Haddon, Morgan, Mueller, Jordan, Mackey & Foreman P.C. Ridley, McGreevy & Weisz, P.C. Canges, Iwashko, Bethke & Bailey, P.C. CBIZ, Inc. & Mayer Hoffman McCann P.C. 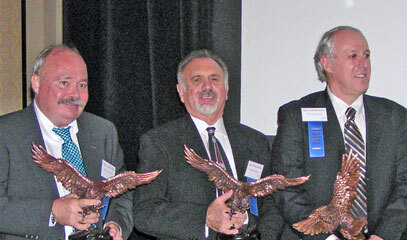 Fisher, Sweetbaum, Levin & Sands, P.C. Treece, Alfrey, Musat & Bosworth, P.C.